The Immigrant Entrepreneurship Program aims to provide the necessary resources immigrant entrepreneurs need to reach their goals. 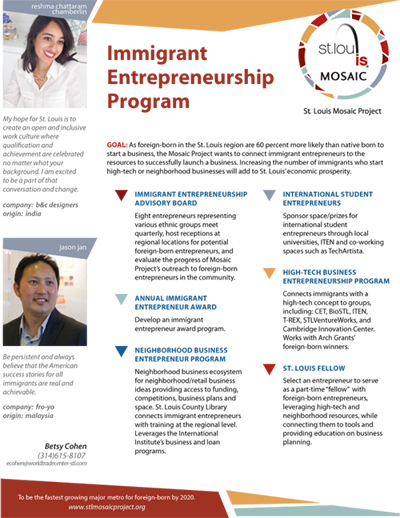 As foreign-born in the St. Louis region are 60 percent more likely than native born to start a business, the Mosaic Project wants to connect immigrant entrepreneurs to the resources to successfully launch a business. Increasing the number of immigrants who start high-tech or neighborhood business will add to the St. Louis region’s economic prosperity.